MPAA getting smarter about DRM? "Glickman said the movie studios were now fully committed to interoperable DRM, and they recognize that consumers should be able to use legitimate video material on any item in the house, including home networks. In a major shift for the industry, Glickman also announced a plan to let consumers rip DVDs for use on home media servers and iPods." This is a major step forward, publicly, for the MPAA. While the studios are still committed to digital rights management (DRM), they are at least realizing that consumers want to be able to play movies that they purchase on multiple devices and that current DRM schemes aren't up to snuff. Most people who study DRM think it will never work, but Hollywood is scared to death of piracy, so getting Glickman this far in his thinking should be considered a good first step. The MPAA is eventually going to have to face the facts that soon consumers will want to mix/mash and sample video as well, and will do it whether or not the MPAA likes it. You should also be able to buy a film and give it to a friend - whether on DVD, tape or new formats. Under current DRM you can't, which studios love because they make more sales. But there's a legal precedent called "right of first sale" which says you are allowed to do this. Currently, DRM stops this, and the MPAA will have to address this or consumers will eventually revolt as well. But, a positive sign. From Interplast - "In 1997, a film crew accompanied an Interplast volunteer surgical team to An Giang province in Vietnam's Mekong Delta. The filmmakers donated their services to document the team's experiences and produce A Story of Healing, which earned the 1997 Academy Award for best documentary short subject. The 28-minute film is followed by a short epilogue after the credits which follows-up on two patients 16 months after their surgeries. Ten years after its original release, A Story of Healing has been released under a Creative Commons Attribution-Noncommercial-No Derivatives license (by-nc-nd) and is available for free online." Wow! This is great. And, they are also making the DVD available for sale, for those who don't want to watch it for free online. I bet their sales increase, and will try to find out. Great publicity (I saw this first on BoingBoing which means the entire world has now seen it), and a great way for a nonprofit to better accomplish their mission. Today's post is given over to the text of a recent email from Ray Privett of NYC's Pioneer Theater. He's calling a meeting to discuss the potential ramifications of a recent MPAA pushed law in NYC aimed to fight piracy, but which could have broader implications. The meeting is today, and I can't make it, but Ray has promised updates. "Secretly videotaping movies in a New York City theater for illegal sale on the street would be a misdemeanor, with penalties including possible jail time, under a bill the City Council approved Thursday." The law is here, and it proves to be more restrictive than the HR article indicates. As a movie theater operator, who is very concerned about the ongoing strength of theaters as exhibition spaces, and also as someone who cares a lot about filmmakers being able to profit from their hard works, I am very sympathetic to and appreciative of the law. However, I have some pretty sincere reservations. It is in that context that I have called the informal, open meeting for Thursday, April 19, 1pm, at the Pioneer Theater, 155 East Third Street Near Avenue A. At this meeting I want to discuss the ramifications of this law as it relates to film showings of public domain or other free to copy / reuse movies, where videotaping is encouraged. What defines a movie theater? What defines a movie? Does this resolution overlook contexts where sharing is authorized and appropriate, in a rush to redefine movie theaters according to the MPAA's dictates? Should a protest exhibition / civil disobedience act be mounted? Feel free to bring your friends who might also be interested. If you or your friends are lawyers, or city council people, you are all very welcome. In the remainder of this letter, I sketch out my reservations in further detail. Here is the law, which, from my reading, seems to have passed and will become active within the next few months. Let's look at a few scenarios that this law affects. I'll start with a few scenarios about which there should be little debate, but then I'll move onto a scenario that I think is more complicated. Robert buys a ticket to a screening of THE DEPARTED, which has reserved all copyrights. Robert gets a seat with a clear view, from which he videotapes and audiotapes the entire movie. He goes home, and dumps his taping of the movie onto his computer. From that, he prints DVDs, which he sells on the street. Has Robert violated this law? Yes, he has. In the parlance of the law, Robert has used a Recording Device, within a Place of Public Performance, in an Unauthorized Operation. By selling DVDs, he also is directly profiting from this action. Should this be a criminal act? In my opinion, yes. As it is. Alice buys a ticket to another public screening of THE DEPARTED, which, still, has reserved all copyrights. Alice also gets a seat with a clear view, from which she videotapes and audiotapes the entire movie. She goes home, and dumps her taping of the movie onto her computer. She then places the file online for download. Has Alice violated this law? Yes, she has. In the parlance of the law, Alice has used a Recording Device, within a Place of Public Performance, in an Unauthorized Operation. She has not, however, profited from this action, because she has not sold anything. So, those are two scenarios that are relatively clear. They are also, probably, the scenarios the law intends to address. They are the scenarios addressed by the spirit of the law and also the letter of the law. But let's look at Scenario C.
Bill buys a ticket to a public screening of some short movies. Casey and Rudy made one of those short movies. Their short is licensed under a Creative Commons 2.5 Attribution, Non-Commercial, Share Alike license (http://creativecommons.org/licenses/by-nc-sa/2.5/). The screening is in a commercial venue, but Casey and Rudy have authorized the screening, thus waiving the "non-commercial" part of their license. Bill goes to the screening, and videotapes Casey and Rudy's short while it plays in the theater. He then posts his taping of that screening online, in a manner from which he clearly has not profited. From their own website, Casey and Rudy themselves even link to the tape Bill recorded in the theater. Has Bill violated the law in question? Yes, it seems, he has. In the parlance of the law, Bill has used a Recording Device, within a Place of Public Performance, in an Unauthorized Operation (as he did not receive any explicit authorization from the theater owners and managers, who only found out about his taping after the fact). Should this be a criminal act? In my opinion, no. Why should it be? For starters, no copyright law has been broken. But, according to the law that went into effect, Bill has broken a law. I doubt the people who crafted this law had any such scenario in mind as they were moved by the spirit of the law and as they wrote the letter of the law. However, the letter of that law would indeed make what Bill did a criminal act. Now, I don't think the law affects exactly the scenario as documented in that link, because everything happened before the new law passed. But if something similar took place again, it seems the law would be violated. Why? Aren't we inappropriately constraining the definition of what a movie theater is, and of what can be shown there? Doesn't it constrain the definition of a movie theater as a place that only shows "all rights reserved" movies? How does the law affect the ability to remix and reuse "some rights reserved" and public domain works? If you come to the meeting, let's chat about this. Again, this is an informal meeting. To some, the context might seem trivial. But I think the kernel of the issue is important. Join other top leaders in the film and new media community to begin a conversation about transforming the future of the industry in Minnesota. The goal of this summit is to strengthen Minnesota’s economic infrastructure and create a vibrant film and new media industry through all of its relevant sectors, including: education, non-profit organizations, production (including commercial and feature), exhibition and the digital revolution. It was great to join people like Richard Seitz of ITVS, Mike Maggiore of Film Forum, Janet and John Pierson of the Austin Film Society and Grainy Pictures, and Bruce Sheridan of Columbia College, Chicago (among others) to work with the folks in MSP to explore ways to revitalize and sustain their media arts community. I spoke about recent changes affecting nonprofit media centers, looming trends - threats and opportunities, and how we are trying to revitalize what we do at my organization. Others spoke about transforming education, or improving exhibition possibilities, and even how to emulate what Austin has in terms of community. They have a lot going for them - great producers, a good crew base, exciting emerging and established media artists, supportive city leaders (two mayors showed up), and some of the most forward-thinking foundations in the arts. Add to that a great school - MCTC, and some great leaders of local nonprofits - and they might just have the recipe to create real change. "It would be great if there could be an organization that promotes real advocacy, research on the front edge of media arts, training on that front edge and help with distribution. If such a place existed, its what I'd want to join." She's right, and hopefully IFP Minnesota can start to build that home, they're thinking about it already. 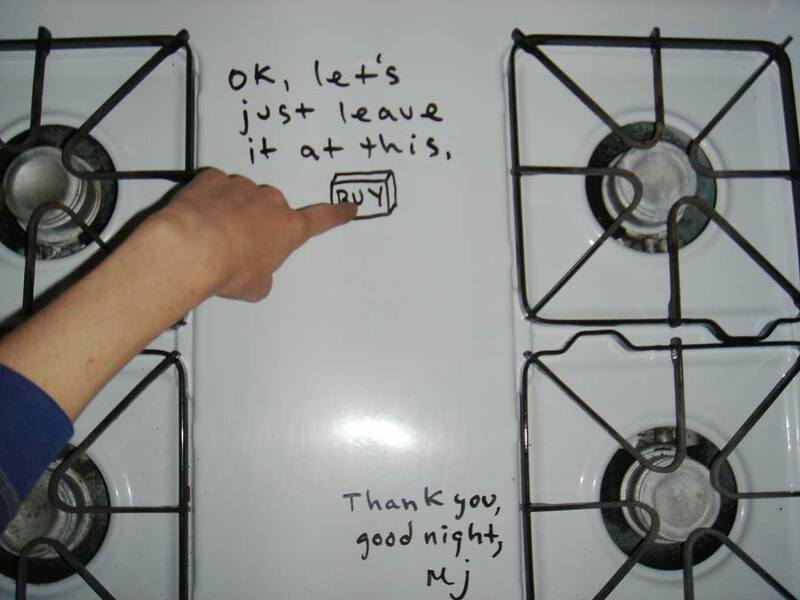 Miranda July has a new book coming out, so she made a website for it. Proof, finally, that there is still creativity on the web. Just back from a great conference at Rice University, in Houston, sponsored by Connexions and the Hewlett Foundation. The conference was on Open Educational Resources – which I must admit gets my vote for worst name for an important concept since Net Neutrality. Open Educational Resources (OER) essentially means what it says, even though it doesn’t say it memorably - to make resources available for free for educational purposes. It’s more than that. In fact, it’s a movement with global participants, and it’s something which filmmakers and those working with them (foundations, organizations, etc) should know and think more about. …teaching, learning, and research resources that reside in the public domain or have been released under an intellectual property license that permits their free use or re-purposing by others. Open educational resources include full courses, course materials, modules, textbooks, streaming videos, tests, software, and any other tools, materials, or techniques used to support access to knowledge. The best way to think about OER is to imagine a hypothetical “student.” Imagine, for example, a college-aged teen in Guatemala (or Kansas, it doesn’t matter) who can’t afford to attend MIT, but who could go online to the MIT Open Courseware site (perhaps via cellphone) and have access to the same materials on engineering that an MIT student has access to – the syllabus, the readings, the videos shown in class, a videotape and/or podcast of the entire semester’s lectures, the notes of students in the class and even the emails or online comments back and forth between students and faculty. Imagine still further that the Guatemalan student could also easily link to works referenced in the course, and have access to those for free as well. For example, the student could be watching a video of a lecture given by MIT faculty on the mathematical principles behind bridge construction practices. When the professor shows a clip from a PBS documentary on the subject, the student could watch not just that clip, but could opt to watch the entire film. When someone in the film references a study done by scholars in London, the student could hyperlink to that study, and access it online, for free, immediately and in a format that allowed the student to easily reference the study in her future scholarship. I could go on with this example, but I think it’s easy to imagine the possibilities – which, by the way, aren’t new, but have been inherent in the nature of the internet and hypertextuality for years, but are now called web 2 or 3.0. The possibilities for further study by this student are immense. The possibilities for education outside the system, the possibility that this student may never attend a university but could be educated and perhaps make change in her society are immense and real. The underlying idea – that anyone anywhere could (should) have access to the same educational resources as anyone else, that education should be open to all – is powerful. In fact, I believe it is more than powerful, I think it’s a natural belief – i.e., one that resonates as “correct and incontrovertible” by all but the most hard-hearted. The possibilities for our world are staggering – that anyone, anywhere, even the poorest among us, could have access to the same knowledge that anyone else, even the richest, have access to and use it to become educated. I don’t think I need to elaborate much, but the same study on OER that I mentioned references astounding figures given by Sir John Daniels, currently President and CEO of the Commonwealth of Learning in Canada, and formerly Vice-chancellor of the Open University, UK. Half of the world’s population is under twenty years old. Today, there are over thirty million people who are fully qualified to enter a university, but there is no place available. This number will grow to over 100 million during the next decade. To meet the staggering global demand for advanced education, a major university needs to be created every week. In most of the world, higher education is mired in a crisis of access, cost, and flexibility. The dominant forms of higher education in developed nations—campus based, high cost, limited use of technology—seem ill-suited to address global education needs of the billions of young people who will require it in the decades ahead. The possibilities of OER to address this situation are limitless, except by the bounds of our imagination. Unfortunately, our legal systems, our educational practices and our societal norms are more confining than our imaginations. Imagine again the hypothetical student above. While the MIT Open Courseware site exists, not all that is put forth could probably be done now. There are potential copyright concerns, privacy concerns, financial concerns – policy concerns that are real, and which undermine a truly open system. Further, there are the concerns of academic journal publishers, professors, not to mention university presidents about how to get paid for this stuff. Further still, are the concerns of parents wondering why they should pay Harvard prices if all the info is available free online (of course, that’s not the same as a Harvard education). There are economic, political and even technical problems, but it doesn’t take much imagination to envision a world where these could be addressed and worked out. But, the concerns are real, and at times just as staggering as the possibilities. All of these concerns, and more, are being thought about and addressed by many people around the globe, people who share the belief that OER is a good goal, but who know it won’t be easy. Copyright concerns, for example, can be partially addressed by Creative Commons licenses and the new Creative Commons Learn project. They can also be addressed, at times, by Fair Use. But, that won’t solve everything. They can be addressed in conferences like the one I attended, in academic circles, in governing bodies like WIPO, in federal, state and local governments, and - more practically – by those of us producing knowledge for others, by thinking about how our cultural production meshes with the concepts of OER. How could OER affect a filmmaker, for example? It means at least that we need new economic models so that filmmakers could be compensated for their work, yet the work could be accessible under OER frameworks. It means that educational distribution will change dramatically. It means that filmmakers will have to think quite differently about their films – perhaps people only need parts of your film for their education, and you may have to think not just about different versions, but also about people literally snipping clips that are relevant to their class, and then a student perhaps “visually quoting” a clip of that clip from your film in their thesis - which will no longer be a paper, but instead a hyper-linked website that might compare your film clip with someone else’s, and perhaps not in the context you intended. This may all seem a bit much – something that can be ignored until you have to think about it, or perhaps irrelevant to you – you don’t make educational films. But, I would argue that these changes affect all visual media, and that as our world becomes more visually based, so will our education. In fact, Greg Ulmer argues that we are moving from orality to literacy to electracy. Ulmer describes electracy as electronic enabled thought, processes, writing, storytelling, business practices - all based on electronic, visual, motion media communication. The media arts then are not just the visual heritage of our society, but are also crucial to our future development as a culture. If he’s right, which I think he is, then your fiction, non-educational film, may become perfect material for someone else’s educational use, and these concerns will affect you. If he’s right, then we need to think about a system that enables electracy, but also enables media artists to make a living while contributing to our culture. I’m not advocating that any filmmaker get too ensconced in OER theory and practice, but if you make films because you think that art can contribute to the world, and possibly change it, then perhaps you should think a little about the concepts behind OER. As I said, this is a global movement, and while you haven’t heard much about it yet, you will hear more soon. I do think that organizations like the one I run, and many others, should be part of this conversation – there’s a lot of work to be done, and lots to think about. When people are debating new models, we should be advocating for systems that take into account the needs and concerns of media artists. When visual media is so central to these new developments, we should be making sure that our best practices remain central to the debate. Too, we have much to contribute – we can tell stories, make visual representations of these concepts and arguably create the most important potential OER materials – visual, motion-based media. OER, like its unwieldy name (an even worse one is being proposed - Open Participatory Learning Infrastructure or OPLI), is a little concept that gets bigger the more you think about its implications. I’ll be thinking about what it means for the field of media arts for more than a little while, and will probably have more on this topic soon.